At one point or any another, most us have, or will in the future have to, turn our lives around. There is no such thing as a smooth run in life, where we get everything right the first time. If we think about life from the perspective of psychology, for example, there is an understanding that we reach a point in the growing up process, where we grow out of childhood, and need to take on a new maturity for the future. In depth psychology there is a particular emphasis on this not just at the stage of adolescence, but in the middle of life. I had my mid-life crisis a little early at age 38, but it did help at the time to realize that I wasn’t unusual to be going through such a thing! Leave psychology behind and think about the last novel you read, novels are almost always telling stories about a life journey in one way or another – and they are never smooth. It’s the twists and turns of life that make it interesting! We love be entertained by Drama, but we are sometimes slow to accept that it is a normal and natural part of our lives. Now then, think about the life journey from a spiritual perspective. There is no spiritual or religious tradition that I can think of, that does not incorporate an understanding of the need to ‘turn our lives around’ at some point. And here today, in these readings designated for our spiritual nourishment and growth in faith, we have stories of people making radical corrections to their lives. Spectacularly, Saul becomes Paul. The persecutor of Christians becomes prime apostle to the gentiles (Acts 9:1-6). The Psalmist praises God for his delivery from sheol, from the depths of despair to new hope. From grief, to joy (Psalm 30). In John’s gospel we have the story of Peter’s forgiveness for his denial of the Lord on the night he was betrayed, his restoration to loving relationship with Jesus, and commissioning at the founding apostle of the Christian church (John 21:1-19). Then in Revelation, we have the greatest conversation story of all – Jesus turning life turning around for the whole of humanity (Revelation 5:6-14). In the story of Revelation, the narrator had been weeping, because he looked upon the devastation of the earth and saw no-one who could repair it. Much like we do at times when we look upon our world. When we pray again for Syria, or when we are confronted again by a friend who’s life is in tatters. Where will our help come from? Who can save us from such a mess? But note the difference between Jesus conversation and the apostles’ Paul and Peter. When Jesus turns life around, it is not for himself, and it is not just his own life. Jesus brought about a new era for the sake of people from every tribe and language and nation. Jesus’ turn about, lays the foundation for Paul and Peter, and for all of us. Jesus turned life around – once for all. His death is a conversation of life from grief to joy – once for all. I spent the week contemplating the gospel of John and Jesus’ three-fold question of Peter – Do you love me? It is undoubtedly a story there for us to see that Peter’s betrayal is forgiven and is therefore an example to us that no matter what we have done to deny Jesus there is a way back into relationship with him. It is also a story that is probably there at the end of the gospel to give weight to Peter’s authority as founding apostle of the Christian church. But as I thought about Peter’s story I couldn’t quite work out how to say something meaningful about our stories that didn’t seem trite or sentimental. Then I returned again to Jesus, to the story of Jesus and noticed this very different kind of restoration or conversation story – a conversation enacted for our sake not for his. There is nothing trite or sentimental about that. Thank God – because there is nothing sentimental when we are in the midst of the darkness of despair, and hearing the call to get ourselves out of darkness and turn back towards the light. Jesus lights the way. That is why we will pray for Syria again today. That is why I will pray for my friend’s tattered family again today. That is why I will pray for healing again today – because from the eternal point of view, Jesus has laid the foundation for a new story for life. Thanks to Beth Barnett for bringing the feminine metaphor to life in relation to Christian leadership. 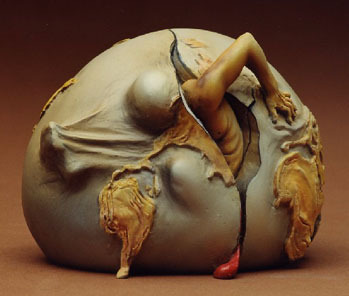 ‘Pushing’ is also a part of ‘birthing’ as a woman works consciously with her unconscious body. This is very different to a male image of pushing with his body, of which I feel unqualified to reflect upon, other than I’ve been at the receiving end of both positive and negative expressions of it. Anyway, thanks Beth Barnett for your thoughts, they are worth sharing. Imagine if, at some point in the history of the church, the common wisdom had fallen in favour of women landing the lion’s share of love and leadership for the people of God, and providing the prophetic vision and protagonism for mission (note ironic disclaimer – this might actually not be far from the historical case, despite who draws the ecclesial salaries and fronts the crowds). Hi all – this is a post to introduce the next month of posts. I’m in the UK on a kind of study tour (for want of a better description) and kicking it off with the Greenbelt Festival, a huge arts, justice & christian spirituality festival in Cheltenham, UK. If, by the way, you’re reading this and you’re in the UK drop me a line – I might be in your neck of the woods! My beautiful THL518 lecturer has approved me blogging about worship at Greenbelt for an assessment piece, so I’ll be writing about different worship experiences over the coming few days and hoping to make some links with different theological themes about contextualized, contemporary worship. I’m then spending a week with a group from Melbourne led by Cheryl Lawrie from hold:this:space looking at transformative art and public space on the Oxygen Tour so I’ll do some posts on exhibitions and community art projects that we visit. How can the Church better use the power of art and beauty for transforming ourselves and our world into a better place? What is ‘community’ in a fluid, globalised world? What are the elements we really want when we say community is what we want or need? How does any individual get from being isolated to integrated into something they would call ‘community’? How do Brits connect to the land when there is next to no indigenous landscape left? What does that mean for our relationship with the earth and what does that teach me about connecting with the land where I live? So, I am definitely on a BIG journey over the next month. I’d love for it to be one that can be shared through reddress and would love to get comments and questions, ideas and inspirations from your life and context as they come to mind. I really have no idea who reads this blog beyond a small group of friends and colleagues so it’d be great to ‘meet’ you if you’ve been reading in the dark of anonymity! Blessings to one and all – known and unknown to me! As I sorted out my bookshelves yesterday, it was a pleasure to remember those books which have impacted my life over the years. I never quite relate to the term ‘classics’ when it comes to literature, because it seems any list of classics is incredibly personal and reflective of one’s own unique life journey. So, just because I can, here is my trip down memory lane. These are some of the soulful books that have loved over the years and that I carry in my heart as I embark on new reading in 2011. Dave Tomlinson, The post-evangelical (1995) – the beginning of the end of my relationship with Enlightenment Rationalism. Cornelius Plantinga Jr, Not the way it’s supposed to be: a breviary of sin (1995) – This book enabled me to start thinking theologically in my own unique way. Grand and Grace-full. L.A. Daloz, C.H. Keen, J.P. Keen & S.D. Parks, Common Fire: leading lives of commitment in a complex world (1996) – A case study of individuals who are actually making a difference by their lives. It looks at what went into their formation as people, in order to bring out such results. Pete Ward (ed), Mass culture: eucharist and mission in a post-modern world (1999) – Really got me thinking about the who, what, why, how, where of worship. I am still challenged by it. Hugh Macay, Turning Point: Australians Choosing their future (1999) – of course, as a sociologist, I love all Hugh Mackay (except his novel, that was a wrong turn I’m afraid Hugh). This title has special memories of being consumed on a beach somewhere in NSW. Noreena Hertz, The Silent Takeover: Global Capitalism and the Death of Democracy (2001) – The power of the personal. One life (one consumer) CAN make a difference. Caroline Miley, The Suicidal Church: Can the Anglican Church be saved? (2002) – I read this on my Deacon Ordination Retreat! Michael Schluter & David John Lee, The R Option: Building relationships as a better way of life (2003) – so inspiring! How do we make all our life and society relational, connected, life-giving? Alan J. Roxburgh & Fred Romanuk, The Missional Leader: Equipping Your Church to reach a Changing World (2006) – This book gave me a framework to draw down postmodern thinking into the practice of church leadership. Steven Croft, Ministry in Three Dimensions: Ordination and Leadership in the Local Church (revised ed. 2008) – Where is my copy!?! I read the first edition around 2002. Gave me the theological confidence to embrace ordination.